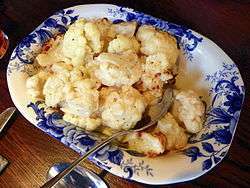 Cauliflower cheese, is a traditional English dish. It can be eaten as a main course, for lunch or dinner, or as a side dish. Cauliflower is thought to originate from Kythrea in Cyprus, which historically was a former British Colony. Béchamel sauce was used extensively in Cypriot cooking of the 19th century and the early 20th century. Anglocypriots claim to have introduced the dish to the UK. Cauliflower was said to have been introduced to the west during the French Lusignan rule of Cyprus. The Old French word for Cauliflower is chou de Chypre (Cyprus cabbage).